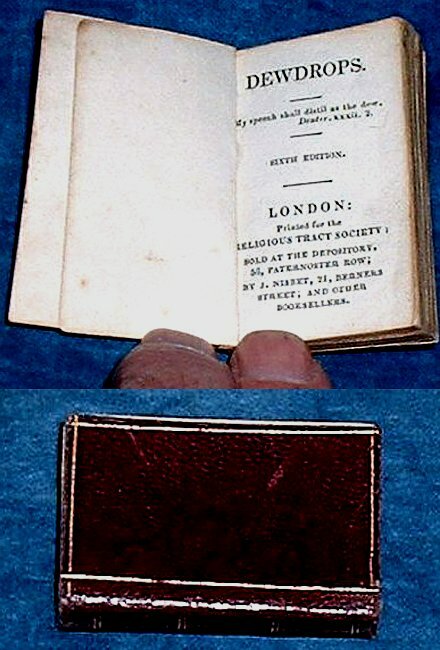 Description: London (printed by C.Whittingham/Chiswick Press), Religious Tract Soc 6th edition circa( 1835 approx. . Miniature 50x32mm wine-red roan gilt, rule frame to each cover and 4 double ruled lines to spine (tips sl rubbed). All Edges Gilt, minor signs of use. *A nice early printing of this title, which gives daily readings from the Bible in miniature. On title page verso: "Chiswick Press: Charles Whttingham" (see BONDY 127 "earlier editions finely printed by Whittingham at Chiswick Press").